A friend of mine recently complained about not being able to tile anything nice with the full set of polyominoes of size 1 though 5. (No, I didn’t make that up! I have weird friends. Who are not made up.) The area of these pieces is 89, which is prime. So our usual tactic of making a rectangle using divisors of the area won’t work. But there is in fact something highly symmetrical that these pieces can tile. And its existence follows from the fact that while 89 may not be composite, it is the sum of two squares. 89 = 25 + 64 = 52 + 82. Which we can tile! If fact, tori are generally relatively easy to tile because they have no edges, and the edge is typically the hardest part of a pattern to tile. Having small pieces in the mix, as we do here, also tends to make tiling easier. So for a challenge, we could try something harder. Any parallelogram can be used as the fundamental domain of a torus. Rectangle and rhombus shaped fundamental domains can have just as much symmetry as a tilted square. (Because the square is tilted, flipping it over isn’t a valid symmetry action, though rotating it still is.) But the tilted square tori still strike me as particularly pleasing and unexpected patterns for tiling. But then I noticed a much easier solution. In your figure, take the tetrominoes LST plus the monomino and L-tromino as one symmetric shape (area 16, more than half the 29) and flip it. I don’t know if either problem is solvable with no corners touching. Inflating every non-largest polyomino by a half-unit gives them a simulated area of 4+6+8+8=26 in the 1-4 case and 26+40+9=75 in the 1-5 case, so that doesn’t rule anything out. 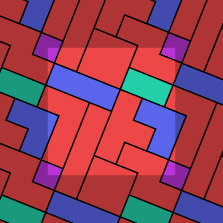 At least in the 1-4 case, you could start with the four inflated polyominoes and three filler monominoes to start a search space, with the benefit that the filler monominoes correspond to the only 3 candidate positions for the O tetromino. Nice. 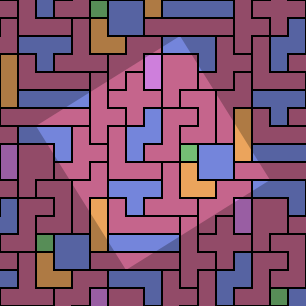 I think when I found that 1-4-omino solution, I was looking for a solution that separated the smaller polyominoes and that also grouped the tetrominoes so that they didn’t wrap around the torus. When I couldn’t find one that did both, I settled for one that only did the latter. 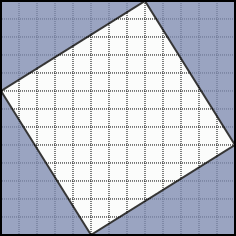 The mono- to pentominoes have a solution with no sub-pentominoes touching at edges or corners. Very nice. The standard follow-up question: can it be done without crossroads?